Ever considered a large sectional in a small living room? 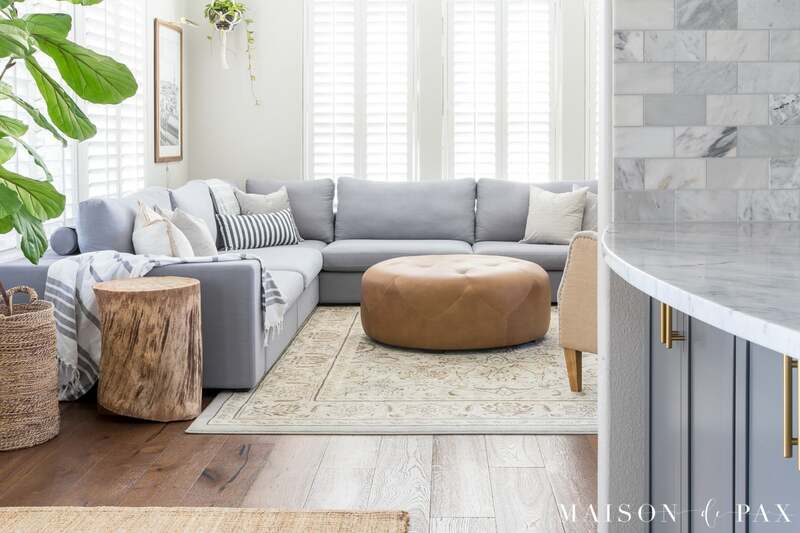 This light, bright living room is anchored by a large blue gray sectional and accented with natural wood and white highlights. 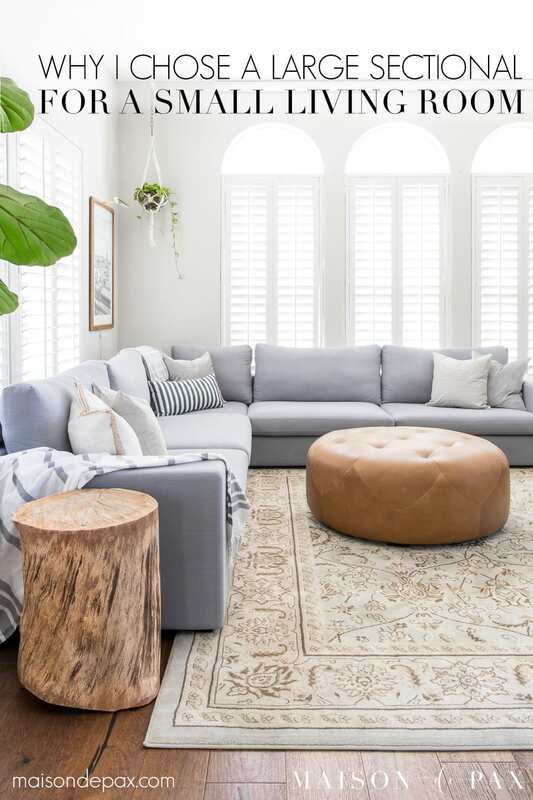 Tour this gorgeous rustic modern living room and find out why a sectional might be the best piece for your family room. I still remember hunter green patterned velour, puffy back, reclining sectionals that completely dwarfed even the largest of rooms… and I shudder. But sectionals have come so far since I was a girl in the early 90’s. And I am thrilled to show you how a HUGE sectional was actually the answer to our rather-on-the-small-side family room. Thank you to Article for providing furniture for this space. I am thrilled to offer a review of Article’s Cube modular sofa and Timpani ottoman. As always, text and opinions are my own. Let me start by stating the obvious to my regular readers: I’ve never really shown this room on the blog before. When we first moved in, we had the tv on a bench in front of the window, two oversized brown leather pieces floating opposite the tv, a bookcase tucked into the corner, and an old tufted ottoman in the center. They all looked beautiful in our old living room (where the tv hung on the wall above the fireplace), but in this room they were awkward and totally inefficient. The room felt cramped, and we could still only seat 4-5 people. So we completely redid the fireplace and created a bookcase nook for the tv (you can read all about that project here), which realigned the room much more logically. But even with the addition of a wingback chair, we could still only seat 5 people really comfortably. Since we are now a family of 6, that proves to be rather disappointing. Let me give a little disclosure: I realize this is not a tiny living room by any standards. But for a big Texas house, where we regularly try to sit 10-12 adults, it’s not large either. The room is about 13’x13′ with two walls of huge windows (which I LOVE, but they do make furniture placement tricky) and – thanks to our fireplace renovation – one wall of cabinetry and fireplace. The fourth “wall” is open past the bar area to our kitchen table. So I set out with two main goals for this living room makeover: add more (and more efficient) seating AND create a light, bright feel. And the key to this space was actually not smaller furniture, but bigger furniture… Crazy, right? Despite its large size, its low profile made it perfect for our walls of windows. The previous couch (which was not particularly high-backed) kept bumping into the plantation shutters and forcing them closed. The view is straight out to our backyard, and it is one of the best parts of this room – and you know how I feel about all the natural light – so the height of the Cube is absolutely perfect. The low profile also helps accentuate the room’s high ceilings and makes it feel so much larger even though much more floor space is actually covered by the sectional. Even better, it can comfortably seat SO MANY people! Our entire family can practically lay end-to-end… not that my kids have tried or anything – ha! And the fabric has a gorgeous linen look but seems so very durable – a huge factor when I’m choosing furniture that my kids will be using regularly. To make that easier, Article even has durability scores of the fabrics on their site; they recommend looking for fabric sofas with a Martindale rub test of at least 25,000 rubs… and the Cube surpasses that by a long shot with a score of 100,000. The couch is firm enough that you don’t fall into it and get stuck (which is important given how low it is), but it’s wonderfully comfortable to sit for hours – working on your laptop or watching a movie. 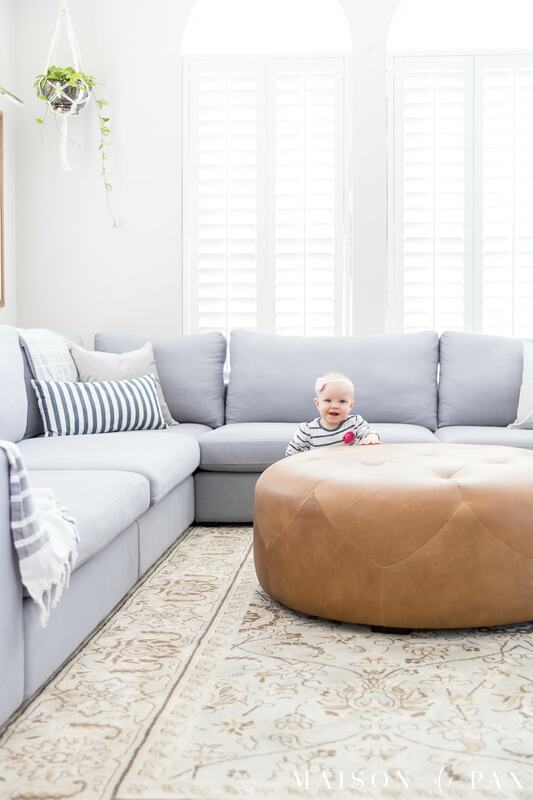 Since I’ve had at least one little one in the house learning to walk for the past six years, I’ve been a big fan of tufted ottomans used as “coffee tables.” But I’ve never loved one as much as I love this. The Timpani in Charme Tan is incredibly gorgeous. 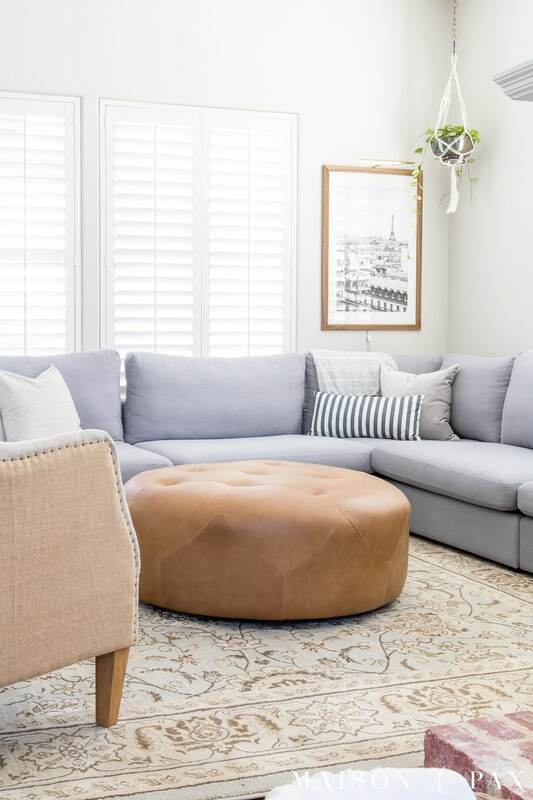 The modular sofa is the piece that makes the room work, but the ottoman is the piece I am smitten by: the beautiful light brown real leather, the stitching in such a pretty pattern, the slight tufting… it’s all perfect. And totally baby friendly. But this post has gotten really long! So I’m going to save all the other decorating details for part 2. In the meantime, what do you think? Do you struggle to get enough seating in your living space? Do you have a small living room? 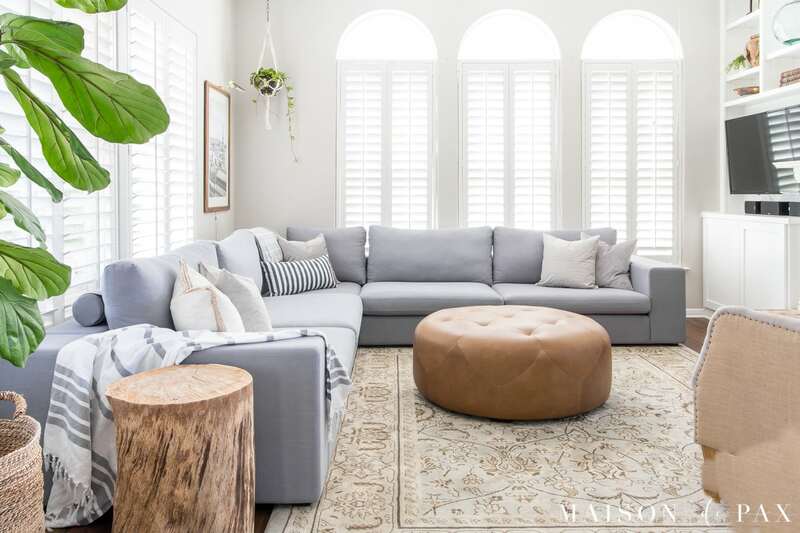 Do you think (counterintuitive though it may seem) that a large sectional might be your answer? I’d love to know! And if you found this helpful and think others might, too, be sure to pin it! I am OBSESSED with this sectional! .. I love your couch. I’ve thought about a sectional but our room is 16 x14 with an entry door, windows and the ugliest large firepace ever. Not sure it would work. I live in Canada so my options are less than yours (even ordering on line) But I am going to go looking now. Thanks for your inspiration. I love almost everything you post. Happy New Year! I hope you land on something that works great with your space! 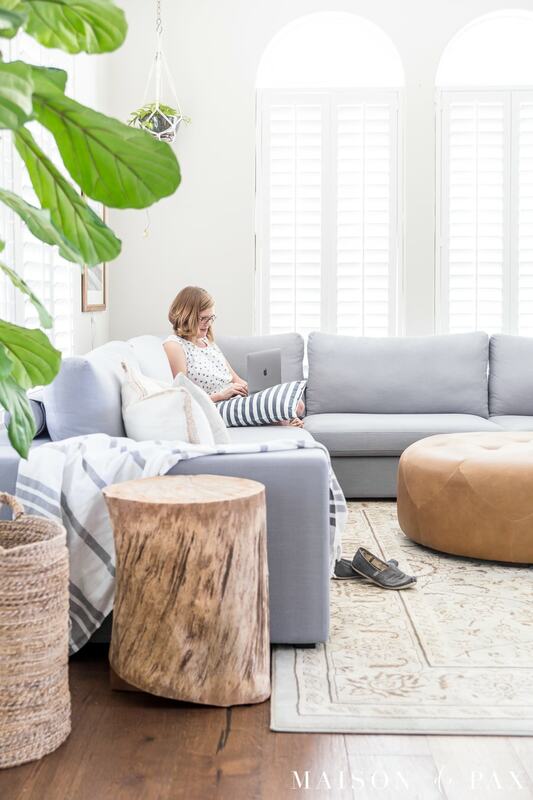 This sectional looks so beautiful in your living room, Rachel! And it seems like a perfect seating solution for all those cute kiddos! Really Beautifully done! Very serene. You did such a nice job. It’s really stunning! I actually love the blue-grey of it and think it ties in beautifully with your marble. Such a perfect mix of warm and cool tones. Brilliant choice! 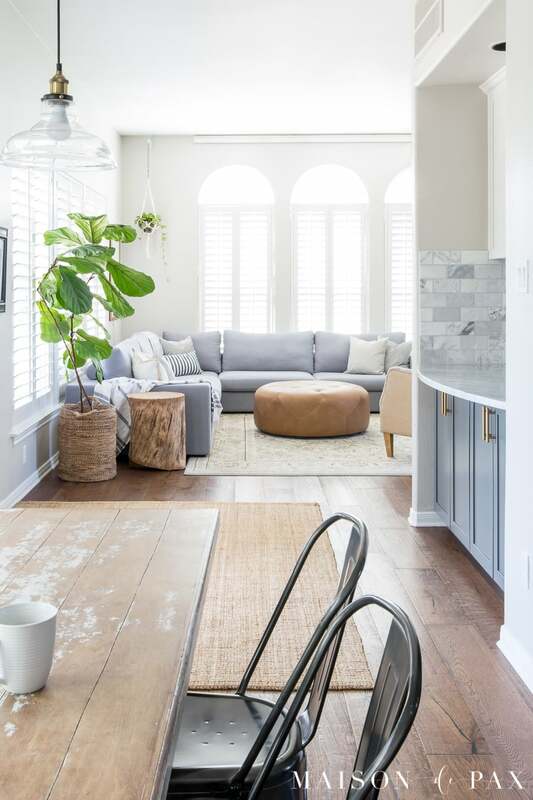 To me the space doesn’t look small at all..Probably because of the neutral tones and the natural light that is coming in along with the light tone sectional….Space seems and looks light and airy. Thank you so much, Shelly! I feel the same way about the size. I know 13×13 isn’t tiny (I’ve had smaller living rooms in the past 😉 ), but it’s not giant either… but the light colors and layout make this space feel so big, don’t they? The sofa is gorgeous, Rachel and it looks so cozy! I love that it’s modular – easy to move around! Nice choice! Will have to check them out! Thanks, Jenna! You’re right, I love that we can rearrange if need be. And yes, everything I’ve seen from Article has been amazing – you should definitely take a look! Wow, I love this sectional, Rachel! I agree, a huge sectional is perfect for that space! I have the same problem with odd furniture placement in my living room but you would never know by looking at the space now that you had any issues. Because it’s perfect! The color is perfect too and I’m loving that ottoman. One thing I’ve learned (the hard way, unfortunately) is that a room full of furniture with visible legs makes any room look cluttered, no matter what size it is. No legs showing on your sectional, the end table or the ottoman coffee table was a wise choice. Great point, Mandy! I hadn’t thought about how the lack of legs kept it feeling clean, but you’re absolutely right. Thanks for the encouragement! “Sectionals are like minivans…” Ha! Best comment of the day! I wouldn’t part with my minivan for the world. 😉 . Thanks, Kathy! I love this room! It’s light and airy and very inviting. Perfect! I’m overjoyed by this! I wish there was a way to show you photos of our home! My husband painted a client’s home Agreeable Gray and will be painting our home the same. We purchased a ranch style home almost 4 years ago and have slowly renovated/remodeled. We tore down a wall between the family room and kitchen and now have a wide open space. The new kitchen island is litereally in the center of our home (measuring 5 x 11); which is painted a mixture of Agreeable Gray and Midnight Fog (sort of a slate blue/ gray). 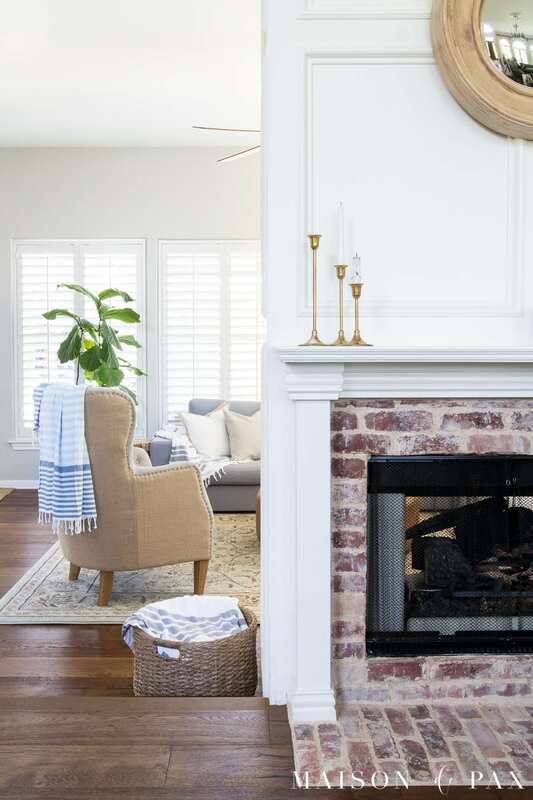 My family room size is roughly the same as yours and does have a brick fireplace. 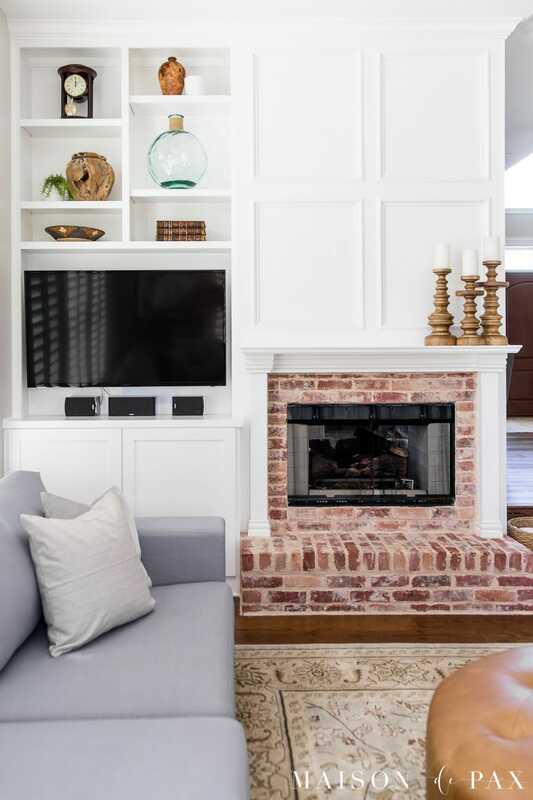 Furniture placement is difficult and I baulked at the idea from my husband to get a sectional because all I’ve ever imagined was over-sized, bulky leather; knowing that it would make te space feel closed in…especially because of the dark brick fireplace. This may be an answer for both of us getting what we’d like! Even with the ottomon (that I could put a tray on), I wouldn’t feel like I’m giving up end table space. I do have a question (after so much rambling): I looked on Article’s site at the sectional that you have. For the two ends, there is a 3rd “open” cushion. Is that also what you have in addition to the corner? If so, how did you add a back cushion to it? thank you for reading my long comment and I do wish that there was a way for me to send you a photo or two of what I’m working with! haha! I’m so so glad you found this so helpful, Kela! Apologies for the slow reply; I was reaching out to Article to ask about the product changes because – as you said – I ordered each piece separately, but they don’t have that option at the moment. My contact said that they are updating the Cube line right now, but they should have all the separate pieces available again later this year. I hope this helps, and good luck with your space!! Thank you SO MUCH for contacting Article to see what is what! I’ll be keeping an eye out for the updates! the idea of looking at larger pieces for a small room is how i will be shopping for some new pieces for our really small MULTI PURPOSE room. thanks for the new way of looking at a challenge. Lets hope our outcome will be as beautiful as yours. or at least very close to the happy room you have created. I’m so glad you found this inspiring, Brenda!! I love your sectional and it does not look that big, it made a great area with your kitchen to spend with your family.Like the ottoman too. RACHEL, HAVE YOU EVER THOT OF PAINTING YOUR TV WIRES? IN THIS CASE, PAINT THEM TO MATCH YOUR BOOKCASE COLOR. I HAVE PAINTED EVERY SINGLE ELECTRICAL WIRE IN MY HOME, SOME WHITE, SOME DARK BROWN , SOME ARE EVEN PAINTED WITH 2 COLORS…ONE TO MATCH THE WALL COLOR AND THEN WHEN IT GETS ON THE FLOOR, THAT SECTION OF WIRING IS PAINTED THE FLOOR COLOR. I ALSO COIL EXCESSIVE WIRES INTO A 2-3 INCH CIRCLE, ATTACH THE COIL IN 2 PLACES AND PAINT ALL OF THAT INTO THE PROPER COLOR. MY EXCESSIVE WIRES ARE ALSO ‘TIED’ TO THE TABLE LEGS AS THEY RUN DOWN THE LEG. WIRES CAN ‘DISAPPEAR’ WITH JUST A LITTLE EFFORT AND THOT. I love this room. I’m not normally a fan of the sectional. But this is great. It looks so well and fits just right. This room is s open looking in spite of the smaller size. I like it. I like your comments about high ceilings. Learned something. Tell me how your plant is working out. Do you stand on the sofa? Does it ever drip? I love plants and know their problems. I love how bright it looks …just like the Mediterranean wonderful light. WHERE did you get that chair in the corner?! I would love to find a sectional/sofa with that type of finish (the hand nailed look). It is a great chair, isn’t it? 🙂 It was a Homegoods find a few years ago. Beautiful room! Where are your floors from? Thank you! You can get the details on our floors here. Hope this helps! Is your paint color full strength agreeable gray or half strength? Such a gorgeous airy room! Love the area rug. Where did it come from? Thank you so much! It’s actually from my Etsy shop. You can get a link to it and all the details in the follow up post here where I describe all the decor in the space. I hope this helps! Very nice! I am impressed with your work and got some great ideas to design my living room. You made my day with this great article. Thanks for sharing. Thank you! I am so glad it inspired you. I love your a site! I also have a grey sectional and your post has given me so many ideas for the space. I recently bought a fiddle leaf from world market and although I love it, it seems too short 🙁 how tall is your tree? Thank you so much! I’m so glad you found this helpful. 🙂 My fiddle leaf is probably 6′ tall at its highest point. I have seen a few different sizes from World Market, though, so if yours seems too short, you might check to see if you can get a taller one? Good luck!! Love the sectional! Any idea where you can purchase the end tables? I love the color and feel of the room. Where is you rug from. I love the detail and color! Thank you so much! Unfortunately, the rug is several years old, and I am not sure if they will be getting more back in stock, but here is an affiliate link: https://rstyle.me/n/c8yuxgb5bux . It’s been a great rug! 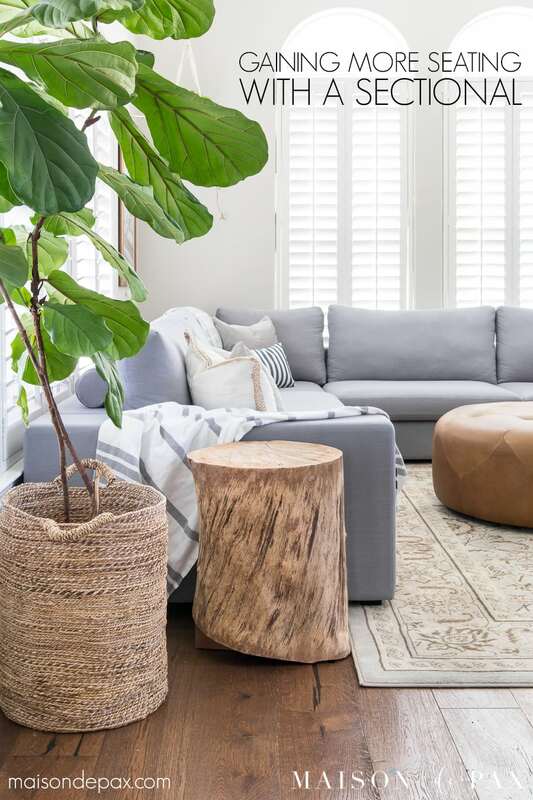 Where did you get the tree trunk side table? Rachel, I absolutely love your living room! It’s a very similar layout to ours. We just purchased our home in August the previous living room furniture just doesn’t go. I went to the Article, and it looks like that sofa has been discontinued. Do you know if they’ll be bringing it back. I really like the exact color and shape you’ve got! Thank you so much, Jessica! I checked with Article, and it looks like they are not bringing the Cube back. However, my contact says that the Gaba is essentially the same as the Cube (but with improvements like more durable fabric). I hope this helps!! Nice article Your post helped me greatly to choose exactly what I was looking for my newly decorate home from long time. Keep it up.